Not presented at the SIHH in Geneva last January, but announced today, is the Microsculpture scène Panthères watch. A spectacular jewellery tourbillon watch in a white gold, rhodiumised white gold case, set with 247 brilliants for 6.52 carats. The manual winding, in house developed flying tourbillon, calibre 9458 is Geneva Seal qualified. Water resistance is up to 30 meters or 100 feet / 3 bars. As a general rule at Cartier, the beaded crown is set wit a brilliant. 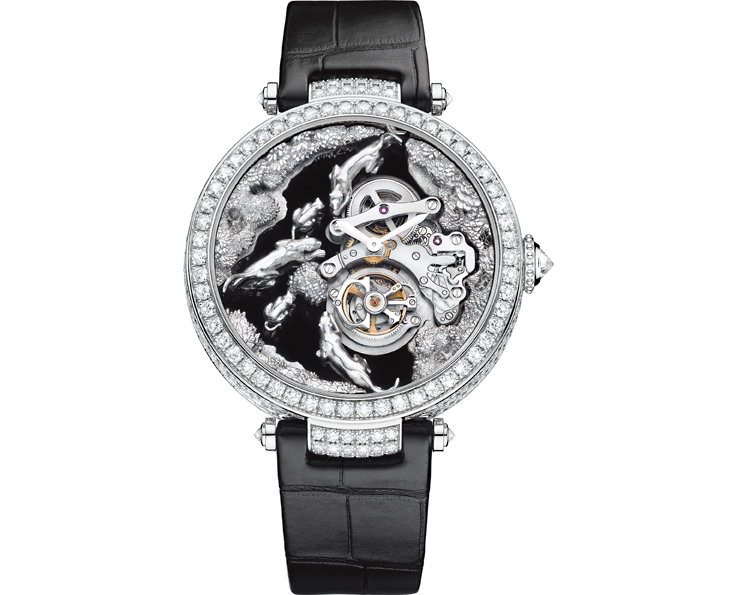 The dial illustrates a savannah scene with white gold microsculpture Panthers. Just 30 pieces will be produced of this extra ordinary timepiece.